List some uses of capacitors. Express in equation form the energy stored in a capacitor. Explain the function of a defibrillator. Most of us have seen dramatizations in which medical personnel use a defibrillator to pass an electric current through a patient’s heart to get it to beat normally. (Review Figure 1.) Often realistic in detail, the person applying the shock directs another person to “make it 400 joules this time.” The energy delivered by the defibrillator is stored in a capacitor and can be adjusted to fit the situation. SI units of joules are often employed. 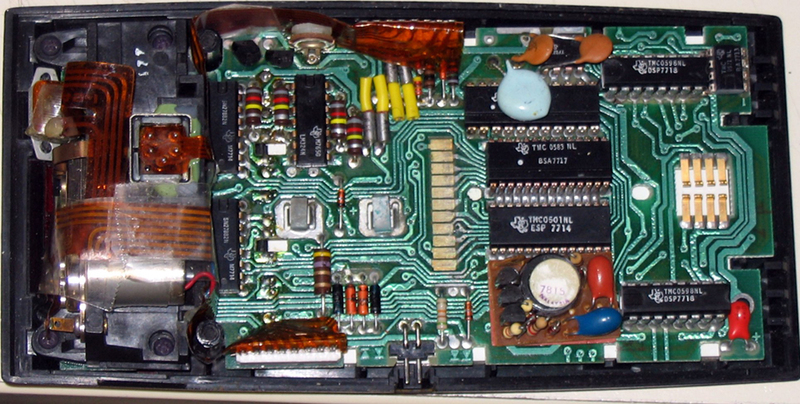 Less dramatic is the use of capacitors in microelectronics, such as certain handheld calculators, to supply energy when batteries are charged. (See Figure 1.) Capacitors are also used to supply energy for flash lamps on cameras. where is the charge and the voltage on a capacitor . The energy is in joules for a charge in coulombs, voltage in volts, and capacitance in farads. where is the charge, is the voltage, and is the capacitance of the capacitor. The energy is in joules for a charge in coulombs, voltage in volts, and capacitance in farads. In a defibrillator, the delivery of a large charge in a short burst to a set of paddles across a person’s chest can be a lifesaver. The person’s heart attack might have arisen from the onset of fast, irregular beating of the heart—cardiac or ventricular fibrillation. The application of a large shock of electrical energy can terminate the arrhythmia and allow the body’s pacemaker to resume normal patterns. Today it is common for ambulances to carry a defibrillator, which also uses an electrocardiogram to analyze the patient’s heartbeat pattern. Automated external defibrillators (AED) are found in many public places (Figure 2). These are designed to be used by lay persons. The device automatically diagnoses the patient’s heart condition and then applies the shock with appropriate energy and waveform. CPR is recommended in many cases before use of an AED. 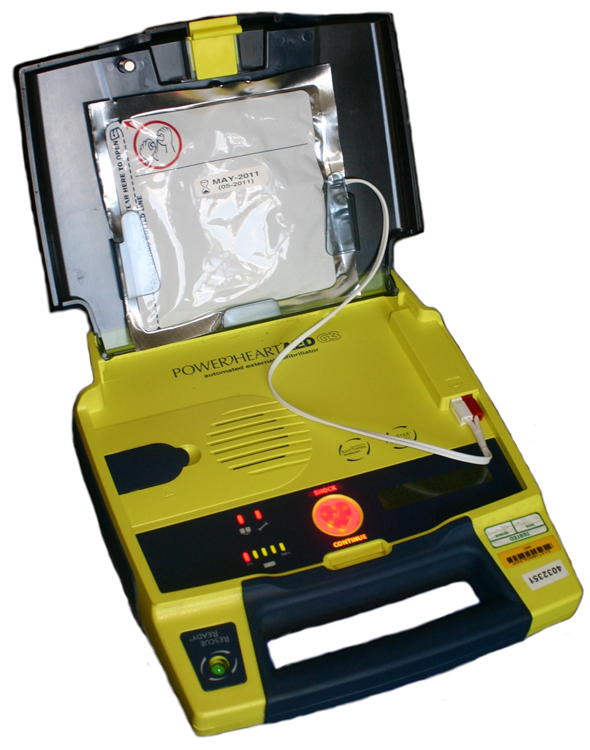 A heart defibrillator delivers of energy by discharging a capacitor initially at . What is its capacitance? This is a fairly large, but manageable, capacitance at . Capacitors are used in a variety of devices, including defibrillators, microelectronics such as calculators, and flash lamps, to supply energy. where is the charge, is the voltage, and is the capacitance of the capacitor. The energy is in joules when the charge is in coulombs, voltage is in volts, and capacitance is in farads. 1: How does the energy contained in a charged capacitor change when a dielectric is inserted, assuming the capacitor is isolated and its charge is constant? Does this imply that work was done? 2: What happens to the energy stored in a capacitor connected to a battery when a dielectric is inserted? Was work done in the process? 1: (a) What is the energy stored in the capacitor of a heart defibrillator charged to ? (b) Find the amount of stored charge. 2: In open heart surgery, a much smaller amount of energy will defibrillate the heart. (a) What voltage is applied to the capacitor of a heart defibrillator that stores 40.0 J of energy? (b) Find the amount of stored charge. 3: A capacitor is used in conjunction with a motor. How much energy is stored in it when 119 V is applied? 4: Suppose you have a 9.00 V battery, a capacitor, and a capacitor. (a) Find the charge and energy stored if the capacitors are connected to the battery in series. (b) Do the same for a parallel connection. 5: A nervous physicist worries that the two metal shelves of his wood frame bookcase might obtain a high voltage if charged by static electricity, perhaps produced by friction. (a) What is the capacitance of the empty shelves if they have area and are 0.200 m apart? (b) What is the voltage between them if opposite charges of magnitude 2.00 nC are placed on them? (c) To show that this voltage poses a small hazard, calculate the energy stored. 6: Show that for a given dielectric material the maximum energy a parallel plate capacitor can store is directly proportional to the volume of dielectric ( ). Note that the applied voltage is limited by the dielectric strength. Consider a heart defibrillator similar to that discussed in Example 1. Construct a problem in which you examine the charge stored in the capacitor of a defibrillator as a function of stored energy. Among the things to be considered are the applied voltage and whether it should vary with energy to be delivered, the range of energies involved, and the capacitance of the defibrillator. You may also wish to consider the much smaller energy needed for defibrillation during open-heart surgery as a variation on this problem. (a) On a particular day, it takes of electric energy to start a truck’s engine. Calculate the capacitance of a capacitor that could store that amount of energy at 12.0 V. (b) What is unreasonable about this result? (c) Which assumptions are responsible? (b) Such a capacitor would be too large to carry with a truck. The size of the capacitor would be enormous. (c) It is unreasonable to assume that a capacitor can store the amount of energy needed. 19.7 Energy Stored in Capacitors by OpenStax is licensed under a Creative Commons Attribution 4.0 International License, except where otherwise noted.